Earlier this month we highlighted Annabel Raby and Amanda Chin, FoodCorps Service Members in BPS working with City Sprouts. For our final National Farm to School Month post, we are highlighting two more amazing FoodCorps Service Members working with Boston Public Schools: Harry Meltzer and Christine Randall. Harry is working with the Boston Green Academy located in the in the Brighton neighborhood of Boston, to bring food into the curriculum throughout content-areas, helping students connect to food through science, mathematics, humanities, social justice, and personal experience. Harry is also helping to build a new garden and set up indoor gardening in classrooms to help our students and staff immerse themselves in the excitement of fresh, healthy food! In the Dorchester neighborhood of Boston, Christine is working with The Food Project, leading four weekly 3rd grade classes about food, plant science, and cooking at John Winthrop Elementary School and Samuel W. Mason Elementary School. Christine also assists with organizing and running workdays for Root Crew members at The Food Project. Root Crew is a yearlong, capstone experience in which high school students, from the city and suburbs, develop skills in urban farming, teaching, and facilitating to promote food system change. Our community partners are bringing farm to school lessons alive in the classroom and in school gardens for BPS students across the district! May 30, 2012, Roxbury, MA – Agriculture Deputy Secretary Kathleen Merrigan visited Boston to celebrate the first anniversary of the MyPlate food icon and to announce a month of nutrition events and promotions to mark the occasion. 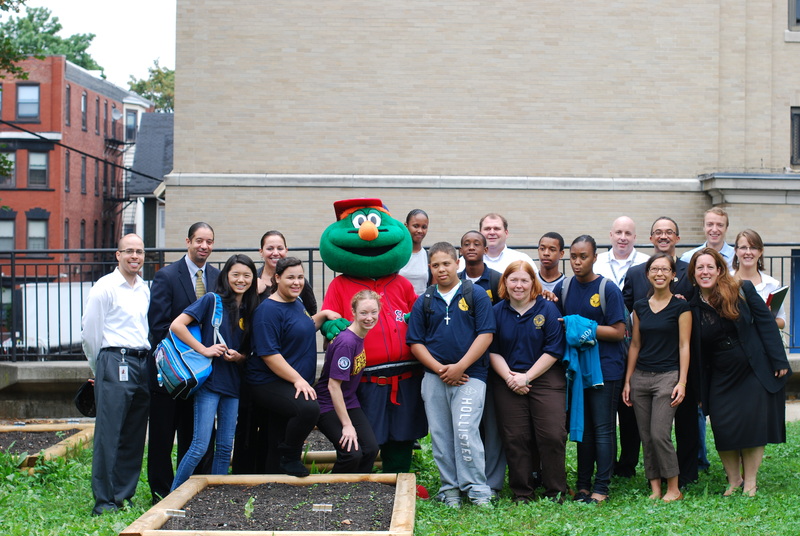 Merrigan joined local officials, staff, and students at Dearborn Middle School in Roxbury for lunch and a tour of the school’s gardens. Dearborn Middle School is putting the MyPlate message into action by promoting healthy food choices and healthier lifestyles. The Dearborn Middle School is using the produce they grow and sourcing locally to provide healthy options on the lunch tray. Sadie Richards, who works with the Department of Food & Nutrition Services as a Food Corps Service Member, has been working with students at the Dearborn School since September, 2011. Sadie teaches a gardening activity block twice a week, during which students have an opportunity to plant, water, weed, and compost, as well as learn about food systems and sustainability. “The school garden is a gateway to experiential learning, healthy eating and sustainable living,” said Richards. “Students come alive as they emerge from the school building into the cultivated urban ecosystem, where they learn and teach their peers to grow and appreciate a variety of fruits and vegetables, many of which they have never seen growing or ventured to eat before.” Read more about Sadie’s work HERE. Wally and friends from the Dearborn in their new school garden. 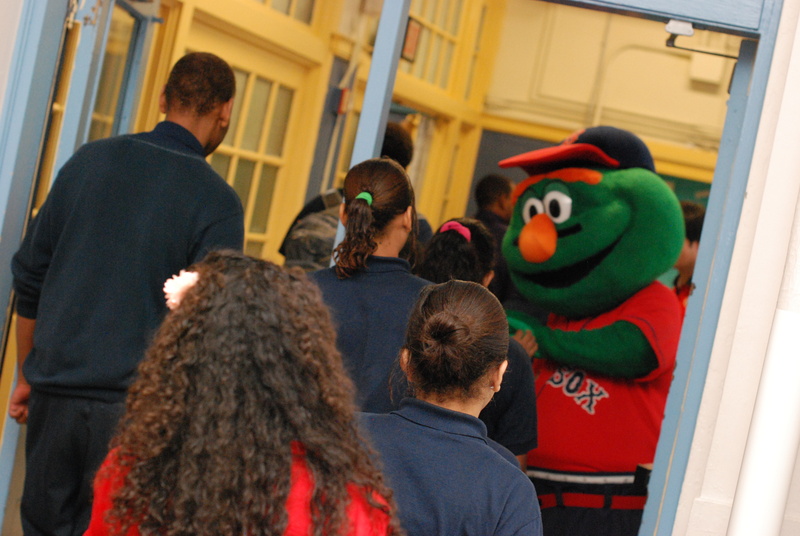 Thursday September 22, 2011, Dearborn Middle School celebrated MA Harvest for Students with a very special guest: Red Sox mascot, Wally the Green Monster! Wally along with other distinguished guests, including City Councilors John Connolly and Tito Jackson, School Committee member Mary Tamer, and Edith Murnane, Director of Food Initiatives for the Mayor, encouraged students to fuel their minds and bodies with healthy foods such as the locally grown green beans on the school lunch menu. The auditorium roared with excitement for Wally the Green Monsteras he was introduced as a “champion for eating his greens”. Wally gave two thumbs up for locally grown green beans and high fives to all the students as they filed out of the auditorium and up to the cafeteria. Jose Duarte, Principal at the Dearborn, encouraged students to try these healthy options in the cafeteria and emphasized the importance of making healthy food choices by comparing eating well with putting good quality gas into a nice car. “You wouldn’t put cheap gas into a really nice car, would you? What happens if you just eat a big bag of chips from the corner store?” Duarte asked the crowd of middle school students. A few student from the back responded, “You’ll probably crash!” BPS Farm to School Initiative is not only increasing the availability of healthy options in the cafeteria but is also educating students about the importance of making healthy food choices and how these healthy foods are grown through their new school garden. Wally 'high fives' students at the Dearborn on their way to the cafeteria. 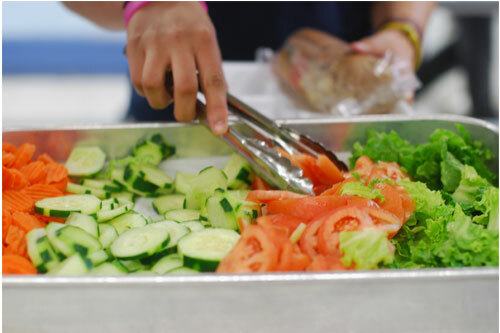 Dearborn Middle School is one of Boston Public Schools’ 44 full service cafeterias that served up a share of the local harvest with Massachusetts grown apples, pears, collard greens, cabbage (homemade coleslaw), broccoli and roasted green beans this week. Every Thursday is Local Lunch Thursday in all of the BPS’ full service cafeterias. So look out for more locally grown items on the lunch line every Thursday this year! Food & Nutrition Services would like to welcome Sadie Richards, our new Food Corps member! Food Corps is a pilot program of Americorps which aims to provide nutrition education in schools, build school gardens, and bring more local food into school lunches. 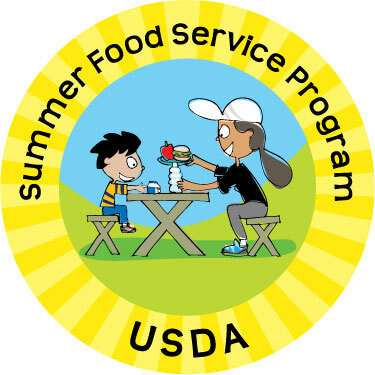 Sadie will be working with Kim Szeto and the Farm to School Initiative to continue work with bringing local food into cafeterias. She will also be spending much of her time building and maintaining a school garden at Dearborn Middle School and working closely with faculty and teachers there to incorporate food and nutrition curriculum into the classroom. Sadie is part of a broader team of six Food Corps members working around the Greater Boston area with The Food Project and City Sprouts. We welcome Food Corps to Massachusetts and are excited about the work they will be doing this year and the seeds they will sow in our schools.